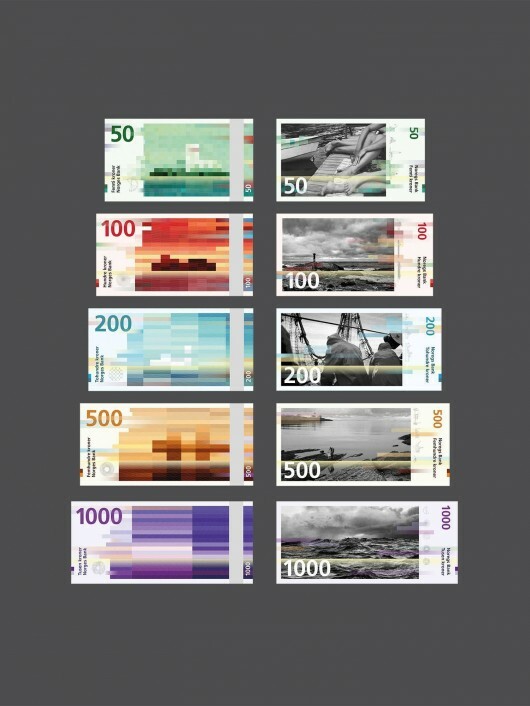 Snøhetta Designs New Banknotes for Norway | Helios Media Design Pte. Ltd.
Snøhetta’s pixilated concept for the Norwegian banknote has been selected by the Central Bank of Norway to serve as the “foundation” for the backside of the new kroner notes. This news, announced yesterday in Oslo, also confirmed that the notes’ front will be based off The Metric System’s more “traditional” design featuring a images of sailing vessels. Both Snøhetta and The Metric System were among seven designers invited to submit ideas under the nautical theme “The Sea,” in which Snøhetta chose to commemorate Norway’s coastal landmarks with a “visual language” of brightly colored, cubical patterns. Snøhetta and The Metric System will now work with the bank to refine the designs and incorporate the necessary security measures to prevent counterfeit. The new notes are expected to be released in 2017.